Usually the words supermarket wine means jugs of horrid plonk with screw on tops. Even in Italy, where you can get pretty great wines at affordable prices, the choices of high end wines – or even interesting wines – in supermarkets is usually pretty limited. Unless you head over the mall at Collestrada and hit the IperCoop. “I’m not the kind of person that usually hangs out in malls. And being from New York, I don’t buy wines in supermarkets. I’m more used to my local, Rochambeau, where I hang out with the staff and talk wines. But once I land in Italy the first thing I do is head straight for one of the ugliest shopping centers in this area of Umbria, Collestrada. While my daughters want to head directly to Benneton, and my nieces want to buy make up, I make a bee line to the IperCoop which, strangely, has one of the best selections of wine in this part of Italy. This is a HUGE supermarket, that sells just about everything, from spare car parts to house dresses to….super tuscans. The wine section is set in one corner, and is usually oddly empty. Since we are in Umbria, this is where you can get all the various Sagrantinos. But since this is a pretty tough wine to drink in the summertime, I branch out. 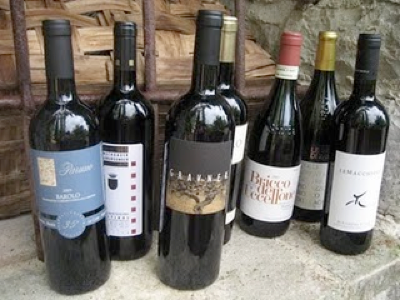 I love the fact that you can buy wines from all over Italy and that they are reasonably priced. And the organization by region makes it extremely easy to find interesting wines from each area. The whole adventure has a bit of an element of treasure hunt, because you can find real gems amidst the more mass produced wines. And it’s a great feeling of satisfaction when you find something like a Valentini Trebbiano D’Abruzzo. Also, I find things I would never be able to get in the states. Since the vast majority of wines under ten euros, I allow myself to go a bit overboard. Yesterday I went really wild and bought a Barolo for 30 euros, which would have cost over 100 $ in the States. The only wines I saw at the same price in the USA were the Gaia wines. 285 euros a bottle. They had a selection of the Super Tuscans, but we didn’t really look at those. It’s not like they have deep coverage from all the regions, but a bit from each. If you’re looking for wine store service in terms of expert help or packaging, you need to go somewhere else (like Montefalco). It’s a supermarket, no one knows anything and this is the third year in a row that the check out cashier was unable take off the wine lock on the more expensive wines.